Mallow Be Thy Name . . .
Color is the central organizing principle of wildflower study. There are a variety of plant structures essential to plant identification. Texture of stem, shape of leaf, and size of seed are all useful. Pause here, though, and look to the far right at the “Categories” section. Open a field guide or three as well. Color is key. Originality is highly desirable, a goal for which to strive, yet I can think of no naturalist, amateur or professional, who first asks: “Do the leaves alternate on the stem?” A flower’s color is a plant’s primary visual element. They are called wildflowers, not wild stems or wild leaves, for this reason. Human nature, the nature of the universe, or both cause complexity to branch out before one can even move beyond the fundamental of color. Beyond the basic primary spectrum resides the subtlety of shades and hues. Phrases like “light blue” and “greenish orange” convey the basic point of appearance, yet there are times when a single precise vocabulary word would be better. Take for example the color purple; a theme that has emerged in my outdoor observations during this month of June. There are numerous variations. One became the name of a classic rock band: Deep Purple. Some plants are so distinct and singular that their names have become synonymous with a specific shade: lavender, lilac, and violet. Turning to foreign tongues, the French coined the term for a shade of pale purple endemic to a specie of wildflower I recently found growing, and blooming, in the West Village near the corner of Hudson and Gansevoort. The French term is “malva” – a pale purple known in the English as mauve. Malva parviflora, known also as cheeseweed or marshmallow, is an herbaceous perennial immigrant from Europe and North Africa. The plant resembles a low creeper like ground ivy or deadnettle. 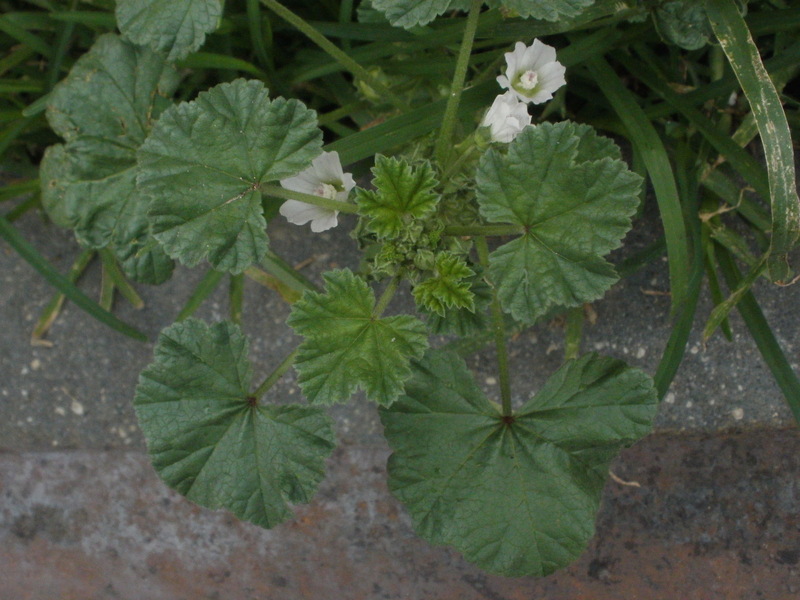 The leaves are alternate, lobed, and scalloped like a cultivated geranium. The blossoms cluster in small groups beneath the leaves in a manner familiar to those who have grown zucchini or melons. 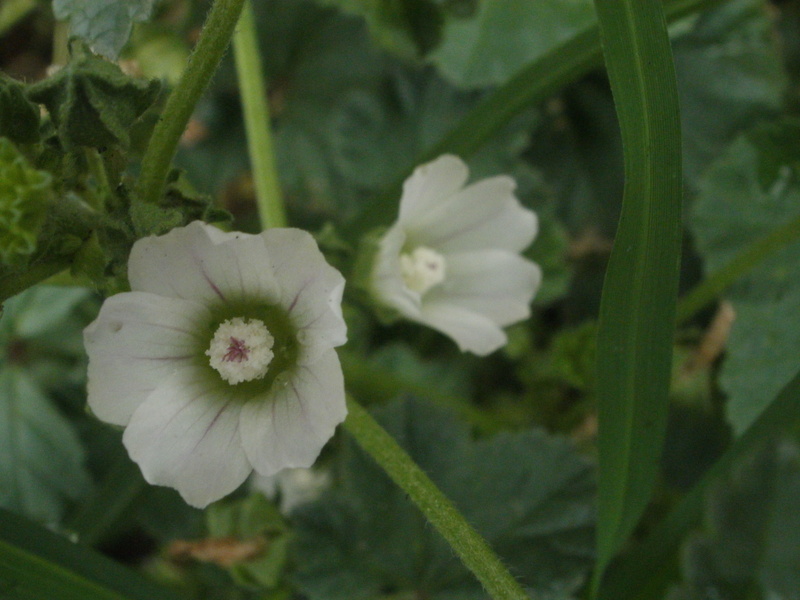 The flowers consist of five white petals striped with mauve ridges. The flowers look like miniature versions of their tall, vertical, domesticated relative, the hollyhock.